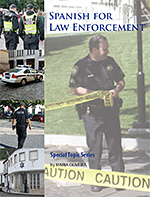 Spanish for Law Enforcement was created specifically for police, security staff, and fire fighters who interact with Spanish speakers in the workplace and out in the community. The lessons are devoted to work situations, with words and sentences suggested by personnel in the field. The program includes a CD for listening and repeating, a transcript of the CD for those who like to read along with the teacher, and a workbook consisting of written exercises and short, practical lessons. It is designed to ease the student into Spanish and provide immediate results. Improved communication! Your job performance will be improved by your ability to state commands, ask questions, or issue requests in Spanish. Improved efficiency! Avoid confusion, time delays, and unnecessary calls for translators. Increased trust and cooperation! Ease comfort levels in an emergency situation; decrease feelings of intimidation.